Nerf Mp3 Speaker, $19.99 from Target. Hey guys, I was on Target’s site just a minute ago and stumbled across this Mp3 speaker. The site says that it isn’t sold in stores, and there isn’t even a description of it on it’s own page, but I thought it was pretty cool and worth showing. :] Does anyone know anything about this little speaker? Any good? 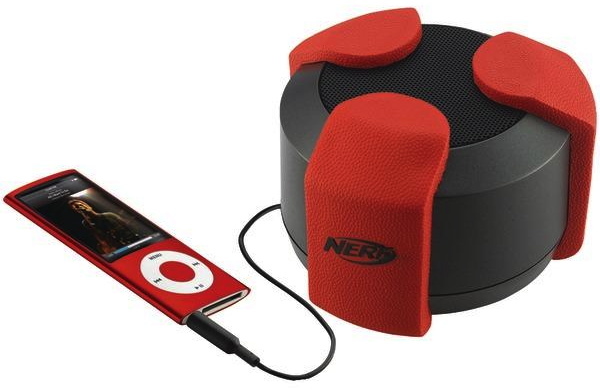 I know Nerf just announced a couple Mp3 players of their own at the London Toy Fair this year. I wonder how well the two would work together… Anyway, here’s the link to the speaker’s page, and if they sell out you can just Google it to find another distributer. Happy listening! 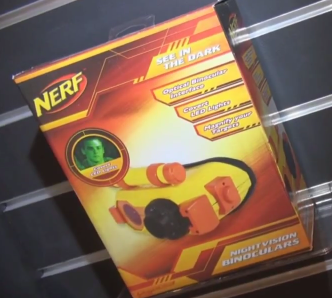 So I just found this video showing coverage of Nerfs presence at the 2012 London Toy Fair, and man am I impressed at what I found. 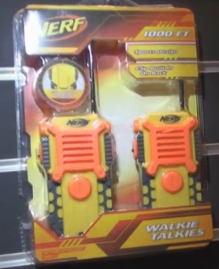 Night vision goggles, helmet cameras, walk talkies, all Nerf-made. Check out the video for full coverage of all the new electronics Nerf will be releasing this year. It looks like Nerf will be releasing a bunch of new gear to accompany its blaster lines. 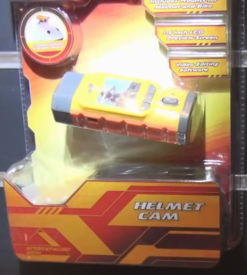 I have a thing for helmet cameras, so I’m pretty excited about what kind of footage members of the Nerf Nation will create using the new Helmet Cams. There are two versions, one with orange accents and one with black, and both come with a built in 1.5 in. review screen and video editing software. Pretty cool, eh? There were also two versions of digital cameras on display (one 2.1 Megapixel and one 7.1 Megapixel), along with two versions of a flip-style handheld camcorder (one 640 x 480p version with orange accents, and one HD version with black accents), a set of walkie talkies with a range of up to 1,000 feet, and an MP3 player with 2 GBs of onboard memory (about 500 songs). The biggest items were two versions of night visions goggles (the packaging was different, but the goggles themselves looked the same. 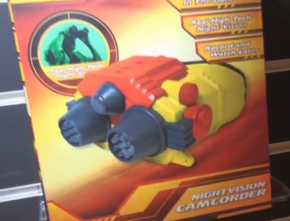 I’m sure something extra comes in the larger box version), and a night vision binocular set that also functions as a camcorder. Come on! Now that’s badarse!